We're going to use various plugins to create our effect. Have you ever created a killer idea for a track but struggled to flesh it out into a full arrangement? Instead of trawling through expansive sample libraries and lists of synth presets in the search for fresh sounds, look at the elements already sitting on your arrange page: you can easily generate new sounds and FX by processing existing parts with creative plug-ins. Buffer/stutter effects, wacky delays and multi-effects can all turn a simple source sound into something very different. You can then bounce these signals down as new audio regions for further manipulation - either on an audio track in your host, or within a sampler instrument. As these creations have been spawned from existing elements, they'll likely fit the overall vibe of the track. Try bussing together two recognisable melodic parts (lead vocal and synth pad, say), then apply glitch effects over this buss. You'll end up with a hybrid sound effect that hints at the two 'parent' melodic elements. For more glitch-based production techniques, get hold of Future Music 290, which is on sale now. Step 1: Here's a simple garage groove at 135bpm. We're going to build upon this foundation and develop our track idea by running the parts through a variety of glitch plugins, generating fresh sonic material that will extend our palette of sounds in unexpected directions. Step 2: First, we run the bass through a glitching buffer plugin - Glitchmachines Fracture - to create unusual clicks and pops. A couple of these subtle clicks are recorded to a new channel and positioned at certain points throughout the groove. Stereo delay adds rhythmic width. Step 3: Another of Fracture's presets is used to create a pitching delay effect around the bass notes, adding extra notes in the groove. Again, we render choice sections of this effect to a new channel, placing them strategically around the original bass riff. Step 4: FabFilter's Saturn is strapped across the drum track. Although this plugin is generally used for more traditional saturation tasks, its Smudge mode produces a strange timestretch effect that we record in and sequence at the end of four and eight bars, creating a glitch-style drum fill. Step 5: Our original bass sound is weighty, but lacks mid-range interest. To remedy this, we insert Sugar Bytes' Looperator over the bass, using its multiple effects to create a buzzy bitcrushed layer. 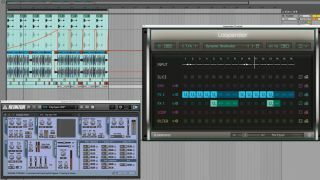 This new part is rendered to a new audio track, and chorus adds width. Step 6: To finish off our sketch, we create an eight-bar 'intro' section by applying an envelope-following resonant filter over the beats. A glitching reverb effect is also automated over the bitcrushed bass layer. Both of these effects are bypassed when the track drops at the eight-bar mark.